Principle 2: Intervening early in childhood can both increase protective factors and reduce risk factors. Research over the past three decades has identified many factors that can help differentiate individuals who are more likely to abuse drugs from those who are less likely to do so (Catalano et al., 2011; Hawkins et al., 1992). Risk factors are qualities of a child or his or her environment that can adversely affect the child’s developmental trajectory and put the child at risk for later substance abuse or other behavioral problems. Protective factors are qualities of children and their environments that promote successful coping and adaptation to life situations and change. Protective factors are not simply the absence of risk factors; rather, they may reduce or lessen the negative impact of risk factors (Cowen & Work, 1988; Garmezy, 1985; Hawkins et al., 1992; Rutter, 1985; Werner, 1989). All children will have some mix of risk and protective factors. An important goal of prevention is to change the balance between these so that the effects of protective factors outweigh those of risk factors. Both risk and protective factors may be internal to the child (such as genetic or personality traits or specific behaviors) or external (that is, arising from the child’s environment or context), or they may come from the interaction between internal and external influences. What are some important early childhood risk factors for later drug use? Maternal smoking and drinking can affect a developing fetus and may result in altered growth and physical development and cognitive impairments in the child (see “Pregnancy Matters: Use of Substances and Their Effects During Pregnancy”). Smoking during pregnancy has been linked to increased risk for slowed fetal growth and low birth weight, stillbirth, pre-term birth, infant mortality, Sudden Infant Death Syndrome, and respiratory problems. Using alcohol during pregnancy can cause miscarriage, stillbirth, and a range of lifelong disorders for the child known as Fetal Alcohol Spectrum Disorders (FASDs). FASDs can lead to physical, cognitive, and behavioral problems—for example, facial abnormalities; attention problems and hyperactive behavior; learning disabilities; poor reasoning and judgment skills; and problems with the heart, kidney, or bones. 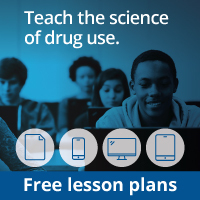 The use of illicit drugs, such as cocaine, heroin, and marijuana, during pregnancy can have a variety of adverse effects on children ranging from low birth weight to developmental problems related to behavior and cognition, such as impaired attention, problems with language development and learning, and behavior problems. The use of some types of prescription drugs during pregnancy may also have an impact on the child. Babies of mothers who chronically take opioid medications prescribed for pain or who are abusing those medications may be born with a physical dependency, causing withdrawal—a condition called Neonatal Abstinence Syndrome (NAS), which can require prolonged hospitalization of the infant and medication to treat. The full extent of the consequences of substance use in pregnancy are not known because many confounding individual, family, and environmental factors such as nutritional status, extent of prenatal care, and socio-economic conditions make it difficult to determine the direct impact of prenatal substance use on the child. Therefore, abstinence is the best prevention. Having a difficult temperament in infancy may set the stage for the child having trouble with self-regulation later, as well as create challenges for the parent-child relationship (see “A Child’s Temperament”). All children are born with a unique temperament, or personality characteristics (Goldsmith et al., 1987) that make them easier or harder to care for. For example, babies who are easy to manage, adapt well to routines, and are responsive to parent care tend to elicit positive parenting behaviors, which will strengthen a growing, mutually satisfying parent-child relationship. On the other hand, some babies respond to their environment with arousal and distress; they may cry a lot, fuss when being changed and fed, and are not soothed by holding and rocking. These highly reactive infants are more likely to elicit parental frustration, impatience, and avoidance or neglect, which can potentially escalate into a pattern of negative family dynamics (Kochanska & Kim, 2013; Lee & Bates, 1985). These natural behavioral tendencies are the focus of early interventions for parents. Such interventions nurture appropriate expectations of infants by parents, strengthen positive parenting practices, and help parents to cope with frustrating situations. Insecure attachment during the child’s first year of life can cause a child to be aggressive or withdrawn, fail to master school readiness skills, and have difficulty interacting with adults or other children (see “Attachment”). Attachment is the natural bond that develops between parent and child (Ainsworth et al., 1978; Bowlby, 1969; Bowlby, 1982). Usually this bond is positive and secure, but when children fail to develop secure attachments to their parents, they may perceive that the world is unsafe and eventually mistrust other people and distrust their own abilities to master the environment. Attachment may be insecure due to particular experiences that get in the way of forming a secure bond, to specific personality characteristics of the parent and/or child, or to poor “fit” between characteristics of the parent and child. For example, an easy-going infant may react more calmly to a first-time parent’s clumsy attempts at feeding, changing, and bathing him, whereas a more sensitive child might react with crying and other behaviors that could cause the parent to feel insecure about his or her capacity to parent. This in turn could affect interactions that promote attachment security (e.g., sensitive, contingent-responsive parenting). However, this is not deterministic. Good quality parenting is possible even when parent/child characteristics and experiences do not match up. Early problems with attachment can lead to problems like acting out in school, poor academic achievement, and social isolation during the transition to elementary school (Fearon et al., 2010; Kochanska & Kim, 2012). Later on, during puberty, the transition to middle school, and adolescence, children with insecure attachment may associate with peers who exhibit problem behaviors and experiment with behaviors such as delinquency, substance use, and sexuality (Schindler & Bröning, 2015). Uncontrolled aggression when a child is a toddler (2 to 3 years) can lead to problems when he or she enters preschool, such as being rejected by peers, being punished by teachers, and failing academically. Lack of school readiness skills such as failure to have learned colors, numbers, and counting will put a child at a disadvantage in a classroom environment, setting the stage for poor academic achievement. Poor self-regulation can lead to frustration and constant negative attention on the child by peers and teachers at school. Lack of classroom structure in the school environment can lead to additional social and behavioral problems in children who have trouble switching from one activity to another. Stress (Institute of Medicine and National Research Council, 2012; Masten, 1989; McEwen, 2010): All children experience stress at some point, and in fact a certain amount of stress helps young children develop skills for meeting challenges and coping with setbacks that inevitably occur in life. But chronic stressors like family poverty and stress that is intense or prolonged—such as a parent’s mental health problems or a lingering illness—can diminish a child’s ability to cope. These types of stress can even interfere with proper development, including brain development, and aspects of physical health like proper functioning of the immune system (Brown et al., 2009). This is particularly true of children who have experienced the extreme stress of maltreatment, such as abuse or neglect, by parents or caregivers (see “The Special Case of Abuse and Neglect”). Some children who experience a lot of stress early in life, even during the prenatal period, are more susceptible to the effects of later stressful life circumstances than other people (Raposa et al., 2014; Shonkoff et al., 2012; Turner & Lloyd, 2003). Children who have experienced abuse or neglect by parents or caregivers are at greater risk for substance abuse and other mental, emotional, and behavioral problems than other children. Moreover, child maltreatment is associated with family-level risk factors, such as poor parenting skills, parental substance abuse and mental illness, and context-specific risks such as poverty (National Research Council and Institute of Medicine, 2009). The most straightforward way to eliminate the negative effects of child abuse and neglect is to prevent its occurrence. One exemplary preventive intervention that takes this proactive approach is the Nurse Family Partnership (NFP) program, described in "Research-Based Early Intervention Drug Abuse Prevention Programs". Other interventions are designed to address issues in children who may have already been subject to abuse; one example is the Multidimensional Treatment Foster Care Program for Preschoolers (MTFC-P; also discussed in "Research-Based Early Intervention Drug Abuse Prevention Programs"), which addresses developmental issues among maltreated foster preschoolers. Parental substance use: Parental substance use—including smoking, drinking, illicit drug use, and prescription drug abuse—can affect children both directly and indirectly. Substances used by a mother during pregnancy can cross the placenta and directly expose the fetus to drugs (see “Pregnancy Matters: Use of Substances and Their Effects During Pregnancy”), and substances can pass to a nursing infant through breast milk. When parents smoke in the home, it can also expose children to secondhand smoke, putting them at risk for health and behavioral problems (see “Secondhand Smoke”), as well as increasing children’s likelihood of smoking when they grow older (Leonardi-Bee et al., 2011). According to the surgeon general, there is no safe level of exposure to secondhand smoke (HHS, 2006). When children are exposed to it, they can develop the same kinds of health problems seen in smokers themselves. Secondhand smoke exposure in childhood is associated with upper and lower respiratory tract illnesses and asthma, as well as infection and tooth decay; it is the leading preventable cause of ear infection; and it is recognized as the most common preventable cause of Sudden Infant Death Syndrome (SIDS) (Zhou et al., 2014). Also, some components in secondhand smoke, such as carbon monoxide, are neurotoxic. Because children’s brains are still developing, exposure to these chemicals can alter developmental trajectories and have long-lasting effects. Secondhand smoke exposure in children is linked to impaired executive brain function, which manifests most clearly as behavioral problems and an increased risk of ADHD (Pagani, 2014; Padrón et al, 2015). Parental substance use can also impact the family environment by giving rise to family conflict and poor parenting, which could increase risk for child abuse and neglect and involvement with the child welfare system (National Research Council and Institute of Medicine, 2009). Poor family functioning can increase the risk for multiple problem behaviors in children and adolescents, including risk for substance use and abuse (Aarons et al, 2008). Children with a family history of drug abuse also may have increased genetic risk for substance use (Kendler et al., 2003; Young et al., 2006), often manifested in combination with family or other environmental risk factors (Enoch, 2012). Children can learn about substance use from a very young age, especially if exposed to parental substance use and abuse (Noll et al, 1990). However, children are less likely to smoke, drink alcohol, or use other drugs when parents are clear that they do not want their children to do so, even if they use substances themselves (Jackson & Dickinson, 2006). The relationship between substance abuse and other psychiatric disorders can be complex. Although the causal relationships are not fully understood, it is likely that shared genetic or biological risk factors give rise to both substance use disorders and mental illness and that symptoms of one may influence the development of the other, partly because they may affect the same or related brain circuitry and processes—for example, memory and neuroplasticity (Pittenger, 2013). Thus, just as early manifestations of mental illness increase the risk of later substance use, many childhood risk factors for substance use also may increase risk for later appearance of other psychiatric and behavioral problems, including conduct disorder, depression, and delinquency. And substance use during adolescence may also precipitate or affect the course of mental illness—for instance, adolescent use of marijuana may trigger psychosis in individuals with a genetic vulnerability for schizophrenia (Di Forti et al., 2012). If not successfully addressed when they initially present themselves, early risk factors and associated negative behaviors can lead to greater risks later in childhood and in adolescence, such as academic failure and social and emotional difficulties, all of which put an individual at increased risk for substance abuse. What if a child has multiple risk factors? Research has shown that the more risk factors a child has or is exposed to, the more likely it is that he or she will experience problems (see “Accumulated Risk”). It is possible that children whose personal characteristics and family and school environments are highly protective can still succumb to the effects of accumulated risk if they live in areas with high levels of risk, such as the accumulated stress associated with living in a violent environment. 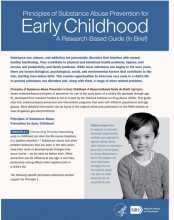 There is as yet no direct evidence supporting this principle in the age group considered in this guide, but evidence from a study on risk and protective factors among a sample of 6th- through 12th-grade students in a five-state survey pointed to the existence of a threshold over which the ability to tolerate risk diminishes. Youth with highest levels of risk factors exhibited increased prevalence rates of problem behaviors, even when they had high levels of protective factors (Pollard et al., 1999). Unfortunately, many risk factors are related and tend to cluster together. For example, child maltreatment is associated with other family-level risk factors, such as poor parenting skills and parental substance abuse and mental illness (National Research Council and Institute of Medicine, 2009); ongoing maltreatment also results in developmental delays, which can compound a child’s risk for later behavioral and emotional problems. Parents and educators should keep in mind that most individuals, even those with risk factors for drug abuse, do not actually develop substance abuse or other mental, emotional, or behavioral problems. Another example is poverty, which reduces a family’s material resources for providing good food, medical care, and child care and thus is often linked with other risk factors such as premature birth and poor nutrition (Gershoff et al., 2003). Poverty may also be linked to problems with attachment, because it reduces the time and energy parents can devote to interacting with their child. As a result, children from impoverished families may encounter multiple risk factors in a variety of developmental contexts. However, individuals differ widely in how vulnerable they are to being affected by specific risk factors. Parents and educators should keep in mind that most young people, even those with risk factors for substance abuse, do not actually develop drug problems or other mental, emotional, or behavioral problems. Resilient children may even have a large number of risk factors but still not experience difficulties (see “Resilience”). A major conclusion from research on risk and protective factors among children is that there are some children who, despite having a significant number of risk factors, do not develop problem behaviors. Intervention developers and researchers use findings from protective factor and resiliency research to inform their decisions about what child, parent, and other resources and skills should be addressed through early childhood prevention interventions (Masten, 2011; Masten 2012). What are some important protective factors that can offset risk factors? Prenatal Period: Good maternal nutrition is important for the developing fetus, as it can reduce the chances for nutrient-related birth defects (such as spina bifida) and can increase the likelihood that the child will have normal birth weight. Infancy and Toddlerhood: Parents who are highly responsive to their infant set the stage for strong parent-child attachment. Preschool: Increasing behavioral control in the preschool years improves social competence across the transition to elementary school. Transition to School: School readiness supports mastery of basic concepts (colors, numbers, letters, pre-reading) during kindergarten, setting the stage for academic success throughout the school years. External factors important in building a context for healthy development across childhood (Masten, 2004; Masten, 2001) include parenting that includes warmth, consistency, age-appropriate expectations, praise for accomplishments (e.g., using the toilet), and consistent routines and rules. When providing such an environment does not come naturally to parents, prevention interventions can help them to build the knowledge and skills important for healthy development and the prevention of subsequent problem behaviors such as drug abuse. Throughout childhood, both at home and at school, it is also important that children be provided both opportunities for social interaction with peers—as playing with other children promotes healthy socialization—and opportunities for physical exercise. Physical activity promotes not only physical health but also cognitive and brain development, including the development of executive control (Hillman et al., 2014; Chaddock-Heyman et al., 2014). Similar to risk factors, protective factors tend to cluster. For example, sensitive, responsive parenting tends to occur along with other environments that promote good social interactions with peers, school readiness, and behavioral control. Generally, an accumulation of protective factors predicts positive outcomes. But just as having many risk factors does not make substance abuse inevitable, having many protective factors does not ensure an absence of problems. Aarons GA, Monn AR, Hazen AL, et al. Substance involvement among youths in child welfare: the role of common and unique risk factors. Am J Orthopsychiatry. 2008;78(3):340-349. Ainsworth MS, Blehar MC, Waters E, Wall S. Patterns of Attachment: A Psychological Study of the Strange Situation. Hillsdale, NJ: Erlbaum; 1978. Bowlby J. Attachment and Loss: Volume 1: Attachment. London: Hogarth Press and the Institute of Psycho-Analysis; 1969. Bowlby J. Attachment and Loss: Volume 1: Attachment. 2nd ed. New York, NY: Basic Books; 1982. Brown DW, Anda RF, Tiemeier H, et al. Adverse childhood experiences and the risk of premature mortality. Am J Prev Med. 2009;37(5):389-396. Catalano RF, Haggerty KP, Hawkins JD, Elgin J. Prevention of substance use and substance use disorders: role of risk and protective factors. In: Kaminer Y and Winters KC, eds. Clinical Manual of Adolescent Substance Abuse Treatment. Arlington, VA: American Psychiatric Publishing; 2011. Chaddock-Heyman L, Hillman CH, Cohen NJ, Kramer AF. III. The importance of physical activity and aerobic fitness for cognitive control and memory in children. Monogr Soc Res Child Dev. 2014;79(4):25-50. Cowen E, Work W. Resilient children, psychological wellness, and primary prevention. Am J Community Psychol. 1988;16(4):591-607. Enoch MA. The influence of gene-environment interactions on the development of alcoholism and drug dependence. Curr Psychiatry Rep. 2012;14:150-158. Fearon RP, Bakermans-Kranenburg MJ, van Ijzendoorn MH, Lapsley AM, Roisman GI. The significance of insecure attachment and disorganization in the development of children’s externalizing behavior: a meta-analytic study. Child Dev. 2010;81(4):435-456. Garmezy N. Stress-resistant children: The search for protective factors. In: Stevenson JE, ed. Recent Research in Developmental Psychopathology. Journal of Child Psychology and Psychiatry (Book Suppl. ); 1985:213-233. Gershoff ET, Aber JL, Raver CC. Child poverty in the U.S.: an evidence-based conceptual framework for programs and policies. In: Jacobs F, Lerner RM, Wertleib D, eds. Handbook of Applied Developmental Science: Promoting Positive Child, Adolescent, and Family Development through Research, Policies, and Programs (Vol. 2). Thousand Oaks, CA: Sage; 2003:81-136. Goldsmith HH, Buss AH, Plomin R, et al. Roundtable: what is temperament? Four approaches. Child Dev. 1987;58(2):505-529. Gregg L, Barrowclough C, Haddock G. Reasons for increased substance use in psychosis. Clin Psychol Rev. 2007;27(4):494-510. Hawkins JD, Catalano RF, Miller JY. Risk and protective factors for alcohol and other drug problems in adolescence and early adulthood: implications for substance abuse prevention. Psychol Bull. 1992;112(1):64-105. Hillman CH, Pontifex MB, Castelli DM. 2014. Effects of the FITKids randomized controlled trial on executive control and brain function. Pediatrics. 2014;134(4):e1063-e1071. Institute of Medicine and National Research Council. From Neurons to Neighborhoods: An Update: Workshop Summary. Washington, DC: The National Academies Press; 2012. Jackson C, Dickinson D. Enabling parents who smoke to prevent their children from initiating smoking: results from a 3-year intervention evaluation. Arch Pediatr Adolesc Med. 2006;160(1):56-62. Kendler KS, Prescott CA, Myers J, et al. The structure of genetic and environmental risk factors for common psychiatric and substance use disorders in men and women. Arch Gen Psychiatry. 2003;60:929-937. Kochanska G, Kim S. Difficult temperament moderates links between maternal responsiveness and children’s compliance and behavior problems in low-income families. J Child Psychol Psychiatry. 2013;54(3):323-332. Kochanska G, Kim S. Toward a new understanding of legacy of early attachments for future antisocial trajectories: evidence from two longitudinal studies. Dev Psychopathology. 2012;24(3):783-806. Lee CL, Bates JE. Mother-child interaction at age two years and perceived difficult temperament. Child Dev. 1985;56(5):1314-1325. Leonardi-Bee J, Jere ML, Britton J. Exposure to parental and sibling smoking and the risk of smoking uptake in childhood and adolescence: a systematic review and meta-analysis. Thorax. 2011;66(10):847-855. Maslowsky J, Schulenberg JE, Zucker RA. Influence of conduct problems and depressive symptomatology on adolescent substance use: developmentally proximal versus distal effects. Dev Psychol. 2014;50:1179-1189. Masten AS. Ordinary magic: resilience processes in development. Am Psychol. 2001;56(3):227-238. Masten AS. Regulatory processes, risk, and resilience in adolescent development. Ann N Y Acad Sci. 2004;1021:310-319. Masten AS. Resilience in children threatened by extreme adversity: frameworks for research, practice, and translational synergy. Dev Psychopathol. 2011;23(2):493-506. Masten AS. Resilience in children: vintage Rutter and beyond. In: Slater A, Quinn P, eds. Developmental Psychology: Revisiting the Classic Studies. London, UK: Sage; 2012: 204-221. Masten AS. Resilience in development: implications of the study of successful adaptation for developmental psychopathology. In: Cicchetti D, ed. The Emergence of a Discipline: Rochester Symposium on Developmental Psychopathology. Vol. 1. Hillsdale, NJ: Lawrence Erlbaum Associates, Inc.; 1989:261-294. McEwen B. Stress and the central role of the brain. Paper presented at From Neurons to Neighborhoods Anniversary: Ten Years Later. Washington, DC, October 28, 2010. National Research Council and Institute of Medicine. Preventing Mental, Emotional, and Behavioral Disorders Among Young People: Progress and Possibilities. Committee on the Prevention of Mental Disorders and Substance Abuse Among Children, Youth, and Young Adults: Research Advances and Promising Interventions. Mary Ellen O’Connell, Thomas Boat, and Kenneth E. Warner, eds. Board on Children, Youth, and Families, Division of Behavioral and Social Sciences and Education. Washington, DC: The National Academies Press; 2009. Noll RB, Zucker RA, Greenberg GS. Identification of alcohol by smell among preschoolers: evidence for early socialization about drugs occurring in the home. Child Dev. 1990;61(5):1520-1527. Padrón A, Galán I, García-Esquinas E, Fernández, Ballbè M, Rodríguez-Artalejo F. Exposure to secondhand smoke in the home and mental health in children: a population-based study. Tob. Control. 2015. Pagani LS. Environmental tobacco smoke exposure and brain development: the case of attention deficit/hyperactivity disorder. Neurosci. Biobehav. Rev. 2014;44:195-205. Pittenger C. Disorders of memory and plasticity in psychiatric disease. Dialogues Clin Neurosci. 2013;15(4):455-463. Pollard JA, Hawkins JD, Arthur MW. Risk and protection: are both necessary to understand diverse behavioral outcomes in adolescence? Soc Work Res. 1999;23(3):145-158. Raposa EB, Hammen CL, Brennan PA, O’Callaghan FO, Naiman JM. Early adversity and health outcomes in young adulthood: the role of ongoing stress. Health Psychol. 2014;33(5):410-418. Rutter M. Resilience in the face of adversity. Protective factors and resistance to psychiatric disorder. Br J Psychiatry. 1985;147(6):598-611. Schindler A, Bröning S. A review on attachment and adolescent substance abuse: empirical evidence and implications for prevention and treatment. Subst Abus. 2015;36(3):304-313. Shonkoff JP; Garner AS; Committee on Psychosocial Aspects of Child and Family Health; Committee on Early Childhood, Adoption, and Dependent Care; Section on Developmental and Behavioral Pediatrics. The lifelong effects of early childhood adversity and toxic stress. Pediatrics. 2012;129(1):e232–e246. Turner RJ, Lloyd DA. Cumulative adversity and drug dependence in young adults: racial/ethnic contrasts. Addiction. 2003;98(3):305-315. U.S. Department of Health and Human Services (HHS). The Health Consequences of Involuntary Exposure to Tobacco Smoke: A Report of the Surgeon General. Atlanta, GA: U.S. Department of Health and Human Services, Centers for Disease Control and Prevention, Coordinating Center for Health Promotion, National Center for Chronic Disease Prevention and Health Promotion, Office on Smoking and Health, 2006. Werner EE. High-risk children in young adulthood: a longitudinal study from birth to 32 years. Am J Orthopsychiatry. 1989;59(1):72-81. Young SE, Rhee SH, Stallings MC, et al. Genetic and environmental vulnerabilities underlying adolescent substance use and problem use: general or specific? Behav Genet. 2006;36:603-615. Zhou S, Rosenthal DG, Sherman S, Zelikoff J, Gordon T, Weitzman M. Physical, behavioral, and cognitive effects of prenatal tobacco and postnatal secondhand smoke exposure. Curr Probl Pediatr Adolesc Health Care. 2014;44(8):219-241.